Narcissists are skilled at making you question yourself. Like normal people, they don’t have to sit and ponder what their next controlling move will be. It is in their nature to be manipulative and they are good at it! They don’t feel remorseful for deceiving, misleading, and lying to you. When they are caught, they are experts at turning the situation around on the person confronting them. Their weapons of choice: confusing and belittling their victims. 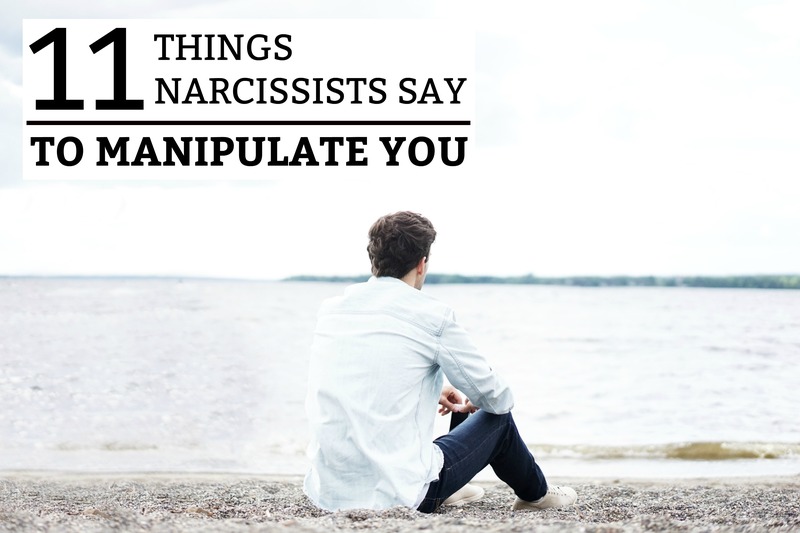 Below are 11 things that narcissists say to manipulate you. This phrase often follows a very mean and belittling comment. They want to make their malicious comments sound like “little jokes”, so that they can always appear innocent. Following these comments, they may look at you to see how you respond. They want you to feel belittled because they know that as long as you remain quiet, they hold the control. If you confront a narcissist on their rude and belittling comments, they will immediately tell you that you are way too sensitive! This tactic turns the situation around on you and makes you look like the person with the problem. Their goal: to silence you. If they succeed, they have planted a seed of doubt in your mind that maybe you did over-react. Don’t let that happen! You don’t deserve to be spoken down to like a child. Call them out firmly and assertively. Let them know that you will not tolerate that type of behavior. If you are in a discussion with a narcissist and remind them of something that they said, you may find them completely denying that they ever said it! They have no problem completely denying what you know to be true. The problem with this is that most normal people tend to question themselves! However, it won’t take very long for you to realize that this tactic is regularly used by the narcissist. You might even feel like you need to record all your conversations, so you can prove to them that they are bold-faced liars. However, their behavior is never going to change – even if they are caught in their own web of lies. They feel no remorse for what they have done and they will always find a way to shift the blame elsewhere. This phrase is often used when you question the narcissist or take the proper steps to remove them from your life. If you don’t allow them to have control over you, they will insult you with accusations of being foolish and childish. If you remove them from social media, you are childish. If you stop talking to them, you are childish. They will try to spread rumors about your “childish behavior” – as if you are the person with the problem. Don’t allow their accusations to hurt you. Their insecurities are so large that they consistently have to focus the attention elsewhere – so that no one will realize that they are the one acting childish. They hold master’s degrees in guilt-tripping their victims. When the narcissist feels backed into a corner, they will often use guilt to make their accuser back off. This is a very successful tactic because it is playing on the emotions and kindness of normal human beings. Whether the narcissist is a parent, spouse, friend, or child – they will find a way to blame you for being ungrateful and selfish. The problem is, no amount of good deeds can cover up the habits of a toxic, jealous, narcissistic person. In fact, this tactic shows that everything they did for you was not done out of a heart of unconditional love. It was all done for a purpose. And that purpose was to make you indebted and dependent on them in some way. Once again, they have come up with another brilliant plan to blame you for their own behavior. This tactic is designed to take the attention off of them and transfer their anxiety onto you. As you feel worse, they will feel better. If you say something negative or accusatory to the narcissist, they will accuse you of having changed. Now that they can’t manipulate and control you, you are the person with the problem! If they say this to you, take it as a compliment. This means that you have stood up for yourself and enforced that their behavior is not acceptable. Just know that they take criticism very hard and will react in a toxic manner. They may say absolutely nothing at all. This is called the “Silent Treatment”. You will hear nothing from them for days, weeks, months, etc. The purpose of this behavior is to teach you a lesson! The narcissist wants you to know that they can easily live without you and that they don’t care how you feel. The silent treatment is to place them in a position of control, where you cannot criticize or confront them. Their goal is for you to come back to them and plead for a reinstated relationship. When this is done, they will demand an apology and ensure that you know that problem completely lies with you. If this happens to you, take the opportunity to run! Just know that when the narcissist realizes that you are completely fine with the silent treatment and are actually thriving without them, they may become even more toxic. They hate being ignored! The narcissist has the emotional maturity of a small child and is toxic to have in your life. They’ve identified that they have a problem and are willing to change! Wrong – most of the time this is just a tactic. If the person truly is a narcissist, there is almost no chance that they are going to change. They may act differently for a little while. They may even go a bit overboard with the excess attention, gifts, and praise. However, they will most definitely return to their old ways of manipulating once they feel they have “got you back”. The narcissist is divisive and controlling. To position themselves in a place of trusted authority, they will plant seeds of doubt in your mind about those around you. They will twist stories, exaggerate facts, and even lie to make you more reliant on them or destroy the reputation of someone they no longer like. The narcissists agenda is to look better than everyone else and put themselves in a place of trusted authority in your life. As your relationship deteriorates, everything will be your fault. The narcissist doesn’t feel empathy and doesn’t accept responsibility for their actions. If they do appear to accept blame for their actions, it is usually just a tactic to get you back under their influence. When you start creating boundaries in your relationship, they will throw a childish fit and shove all the blame over onto you. Your feelings are invalid because everything is about them. They expect you to come crawling back to them, begging for forgiveness. In reality, they need to receive firmly stated boundaries or absolutely no contact. Narcissists don’t respect boundaries, which leaves you with the healthiest choice – removing them from your life. If you allow a narcissist to have a place in your life, you will need to get use to a life of guilt, self-sacrifice, and manipulation. They hide their rampant insecurity behind a facade of confidence. This is the reason they are drastically opposed to criticism. Narcissists rarely change. You simply exist to meet their self-serving needs. If you can identify with the 11 phrases above, you should probably get a therapist and start distancing yourself from this toxic individual. Hah, you are so right in all of these points. Unfortunately, the closest person to me – my mother is a pure narcissist and is giving me the Silent Treatment for the last three months. I’ve played her game for way too long to play it now, so I keep it polite and respecting her as much as I can, but not backing off. I also have a friend, who was dating a narcissist guy – he made her buy new furniture and a car he could use, abused her several times and acted as nothing happened at the end. She’s finally out of the nightmare but wounded forever. We need more articles like this and more clear information to recognise people like that in our lives – they are way too many of them in this world. Thank you! Oh, Rachel. I’m so sorry that you have to go through this. Parents are supposed to be a loving support system that you can count on – and in return, you can be the same to them. However, when a parent is a narcissist, there is no such thing as unconditional love. Everything is conditional and it has to be about them – never you. Stay strong and don’t play the game. I’m so glad that you are aware of what is going on and how to respond. As for your friend, that is so hard! Learning lessons the hard way is so difficult. However, it will help her to see the web of lies and manipulative tactics of the people who will waste her time and use her. I’m glad she has you to understand! Take care, Caroline. This article is spot on and it’s great to have this validation. I work with a narcissist who exhibits all of these traits. This person is highly manipulative and always trying to gas light me. Unfortunately, I just can’t and I won’t leave my job so it can be very toxic. I am however beginning to work towards an exit strategy that will be on my terms. My husband worked for a narcissist manager. They were both the same level but then this guy started taking the stuff my husband did, like writing instructions on machining, and he would change one word and claim all the credit. Upper management thought he was great so they made him my husbands boss. He spread lies about my husband and had him moved to 2nd shift and took away all his signing privileges. There was nothing my husband could do even filing a complaint with HR about a hostile, toxic work environment. They didn’t believe him so nothing was ever done to this person. My husband ended up leaving this company just to get away from this vile, toxic person. These kind of people are out there, just look for the signs and go in the opposite direction. Wow. I can’t believe this. My boyfriend is all of these examples including word for word what they say. Scary but true! I live with him and been with him for 3 years and on top of him being a Narcissist he isn’t affectionate. Do you think he will ever change? great post, from all these i frel like my husband has some qualities of narcisstic people. i don’t understand what should I do. Ok, that is very helpful, and I have heard some of the narcissistic comments before, but the question is: How do you respond to them effectively enough to make them back off, especially if it is a co worker or family member you cannot avoid? I am in the middle of getting out of a narsitic relationship with my girlfriend. This is my first and last time with one of these people. I have made the biggest mistakes of my 58 years of life with her. I bought a home for us and put her name on the deed. She blames me for everything that has gone wrong. All of the articles I see here are spot on, I wish I have seen this before. Hello Jim! I’m glad you found our articles to be useful. I’m so sorry that you have had to experience a relationship with a narcissist. In the beginning, everything seems great! But you will always learn that they are some of the most complex, difficult, draining, toxic, and confusing people you will ever meet. Wishing you all the best as you move forward! i was involved with workplace bullies and narcs for a while. like what they said about narcs, the best way to deal with them is go no contact. narcs are experts in bringing hell on earth. after i quit work, i have to heal myself of the emotional wounds that they inflicted. i have to detoxify my mind. they are so good in making you feel worthless and inferior than worms. nevertheless, i am extremely glad that i am no longer working in that hellish place. i still consider myself lucky, for i never get to feel the need to hurt other people like they do, just to get what they want. i would rather work in an ordinary company with mentally healthy people, rather than work for a fortune company with demonic and unstable-minded, manipulative , pretentious professionals. that’s the only solution have i not experience it myself. even if they will pay me billions, i would never go back there. i would rather work for an ordinary company with mentally healthy individuals, rather than work for a fortune company with manipulative and emotionally unstable professionals in sheep’s clothing. quitting there is one of the greatest breakthroughs in my life. This article relieved my mind of any lingering doubt of whether to be ‘nice’ to my Narcissistic sopouse of 22 years. There will never be a change for the better, only for the worse. Everything in your article has happened in our marriage and I thought for so long I wasn’t a good enough wife. And the just kidding death threats! Well, I am divorcing this person now and oh, my! The tantrums! I have a great lawyer who is receiving an education himself, poor man! I recently realised I have an extremely tight relationship with a narcissistic father and boyfriend. This article helped realize why I have so extreme guilt for them and why my life has totally collapsed. Thank you! So now I can start the way of healing.